Retailers are shifting their strategies to provide better service for consumers, with nearly half in a survey by Auburn University saying their supply chain management strategy is to balance cost and service. By contrast, only 8% said their strategic focus is to cut costs. To enhance service, retailers are focusing on urban markets. 80% surveyed said urban fulfillment is an area of growth, with one respondent describing urban logistics as "the new battleground." Fulfillment in urban areas, however, doesn't come without challenges. Almost 40% surveyed described "final mile cost" as a major challenge. Fulfillment can make or break a customer relationship. Ship an item too late or that's damaged in transit, and the consumer might never place another order. "The customer doesn’t care how we do it. They just want fast delivery and they want it cheap," said one respondent in the survey. Those delivery demands are only getting stronger. A recent survey found consumers are willing to accept a maximum of 4.5 days from order to delivery, and among Amazon Prime users, the number is even lower, at 3.8 days. While it may be the new "normal" for consumers, it's still a struggle for retailers working out logistics on the back end, pushing shippers to get creative with fulfillment strategies. In some cases, retailers are using their stores as fulfillment centers, especially for orders bought online and picked up in store. Urban deliveries present particular challenges, especially transporting in the last mile. Retailers are trying new strategies — everything from contracting with on-demand service providers to expanding use of local couriers, the report stated. While investing in the last mile can be expensive, most retailers agree the benefits outweigh the costs. A majority (80%) of retailers said urban fulfillment is a growth opportunity. Because of the market's potential, they're more willing to invest in processes that improve the supply chain. 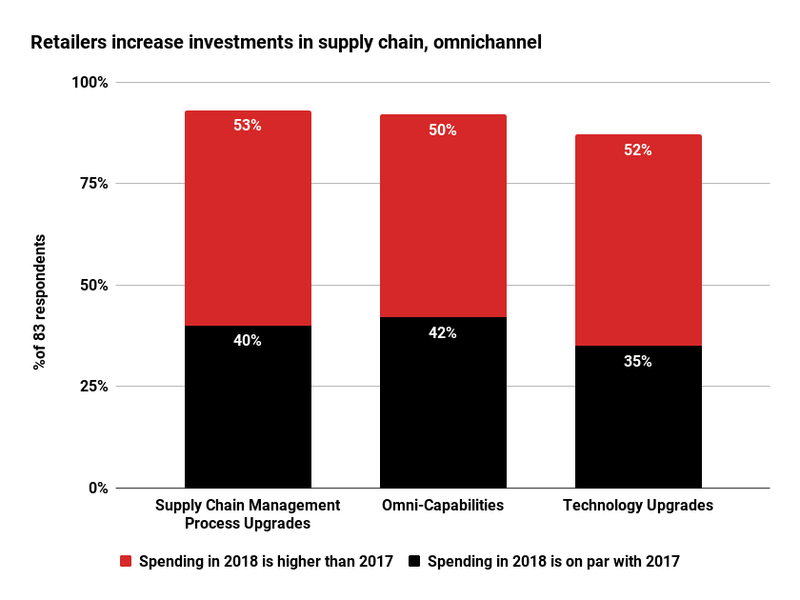 93% said they would invest either the same amount or more money in supply chain management process upgrades, and 92% said spending would be on par or higher for omnichannel capabilities. “Our view is: let’s take on a little bit more supply chain cost because, ultimately, the payback that we’ll generate for the retail enterprise is bigger than the added costs," one respondent said.